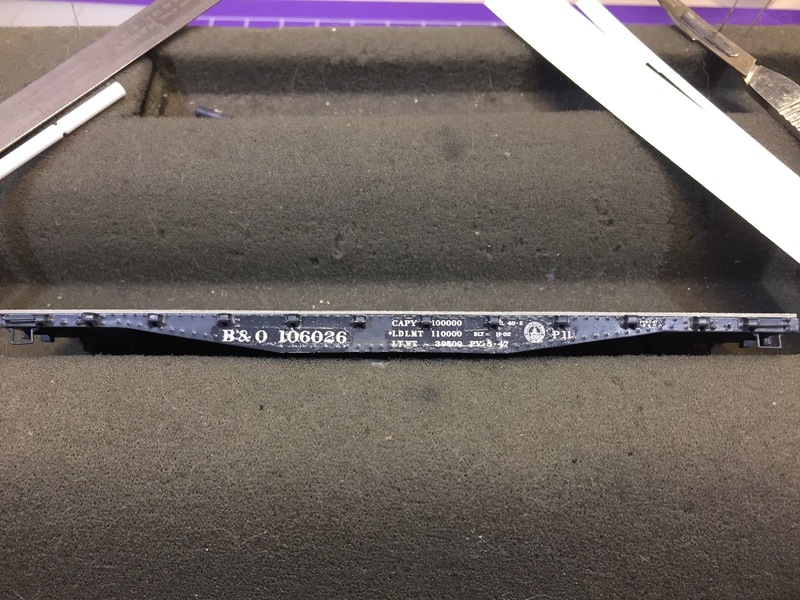 The next step on the B&O P-11 flatcar build is lettering/numbering (click here for all the other posts on this project). First, you have to choose your decals, if you have a choice. The F&C kit I'm using comes with the appropriate decals, but Speedwitch Media makes the correct decals too. Fortunately, the company's owner is a good friend and when he saw I was doing this car, he sent along a set to try. I'm definitely glad he did. The F&C decals are ok, but I think you can tell the difference when directly comparing them to the Speedwitch decals - the fidelity is much better. Next, you need to consult prototype photos for the proper location of the lettering. Unfortunately, the P-11 is a fairly rare flatcar and photos are elusive (in fact, even a query to the Steam Era Freight Car list hasn't turned up any pics as of this writing). I do have a couple of prototype photos, but for lettering I relied on the two photos that came with the Speedwitch decal instruction sheet (the F&C instructions do contain one photocopy of one of the photos that Speedwitch also uses). Once I decided what lettering I wanted to use, I cut it out of the sheet with a scalpel and a fresh blade. You can see what parts I took out of the sheet in the photo above. After they've dried (preferably overnight - or while you're at work), prick any air bubbles with a sharp pin and lightly brush some setting solution like Micro Sol onto the decal - allowing it to wick in under the edges and into the pricked holes - so the decal will really snuggle down and set. Repeat step 10 as necessary, using Solvaset for really stubborn decals. Secondly, I plan to use a more traditional, non-Future (heh - see what I did there? ), approach for the other side (in fact, the same process I used for the Grand Trunk Western boxcar - a post I found only after I'd already done side one of the flatcar...). And Step One in that process is to add a gloss coat to the carbody where you'll be adding decals. So tonight I masked off the side of the car yet-to-be-decaled (notice the eggshell/non-glossy finish) . . .
And shot the side with my handy-dandy rattle can of Testors Glosscote . . . Remove the decal from the water and "float" onto the setting solution (I'll actually put it on a paper towel first). Use a toothpick or something else that's not sharp to position. Wick away any excess fluid with the corner of a paper towel, or a makeup sponge (I'm a little leery of the sponge now...). Let dry. Stay tuned and I'll let you know (and you'll be able to see) which process yields the better result . . .